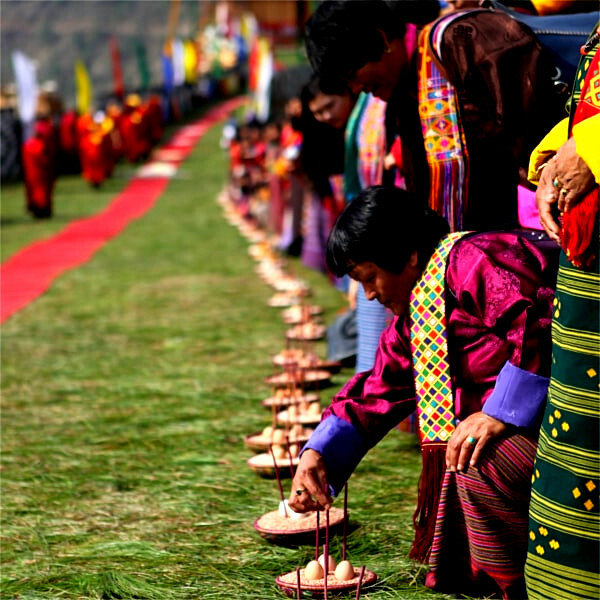 Thimphu Tshechu is a 3 day festival held every year in the capital city of Bhutan; Thimphu. The festival starts on 10th day of the 8th month of Bhutanese (Lunar) calendar. During this 3 day festival, varieties of mask and folk dances are put into show by monks, villagers and national art performers. It is a perfect time for friends and families to get together. All the schools and offices within Thimphu district remains closed during the festival. On arrival, our guide and driver will receive you from Paro international airport and transfer to Thimphu (capital). Towards evening pay visit to Memorial Chorten (stupa). Memorial Chorten: Located in the heart of Thimphu city, it was built in 1974 by Her Majesty the Queen Mother Ashi Phuntsho Choden in memory of her son, Third King Jigme Dorji Wangchuck. The three-storey Chorten houses several relics such as Phurba Lhatshog, Kagay, Khrowo Nampur Gyalwa, Guru Tshengye, and Khenlop Chesum. The Chorten is today the spiritual nerve centre of the city. Today is the highlight of our tour. We will dedicate half of the day for witnessing Tshechu and half for visiting to important tourist sites such as Buddha Statue, Textile Museum and Simtokha Dzong. The principal focus point of Tshechu traditions in Bhutan are mask dances known as cham in local language. These chams are directly related to Buddhist culture and incidents from the life of Guru Rimpoche, a Buddhist saint who visited Bhutan in 8th century from Nepal. While in Bhutan, it is believed that Guru Rimpoche performed mask dances to subdue local spirits and demons that were bringing chaos in the region. He later turned them into as protector of Buddhism. Since then these traditions has been followed for centuries, becoming one of the core values of Bhutanese culture and tradition. Some of the mask dances (cham) performed at Thimphu tshechu are Dance of heroes (Pacham), Dance of Stags and Hounds (Shawo shakhi), Dance of drums originated from Dramitse village (Dramitse Ngacham), Dance of judgement after dead (Ragsha Mangcham) and the Dance of 8 manifestations of Guru Rimpoche (Guru Tshengye). Today we will proceed eastward, towards Punakha district. On the way, we will have stopover at Dochula pass (3100m). 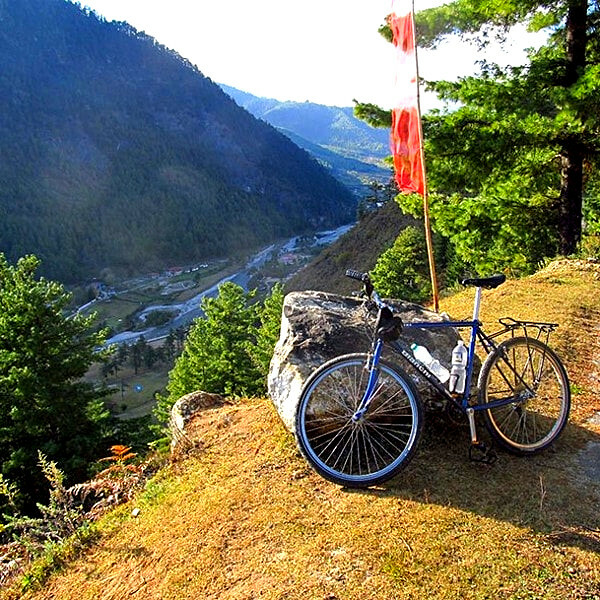 Located 23 km east of Thimphu city, beautified by hundred and eight (108) stupas, Dochula pass on the clear day can offer an astounding view of snow capped Himalayas. From here the road then descends down till our next stopover at Khemae Lhakhang (monastery). Khamsum Yelley Namgyal Choeten: Located in Kabesa Gewog, about 7 km drive from Punakha town; the choeten was built with the sponsorship of her Majesty the Queen Mother Ashi Tshering Yangdon Wangchuck between 1992 and 1999 under the guidance of Dilgo Khyentse Rinpoche and Lam Sonam Zangpo. The three-storey choeten contains the images of Dorji Phurba on the ground floor, Khrowo Khamsum Namgyal on the first floor, and Khrowo Nampur Gyalwa on the second floor. Today we will travel back to Paro. At Paro, pay visit to Paro Ta Dzong (museum) and Paro Rinpung Dzong. Another interesting program of our tour is hiking to Taktsang monastery. Taktsang monastery to Bhutan has become like an Eifel tower to Paris. The hike on average will take around 6 hours in total. 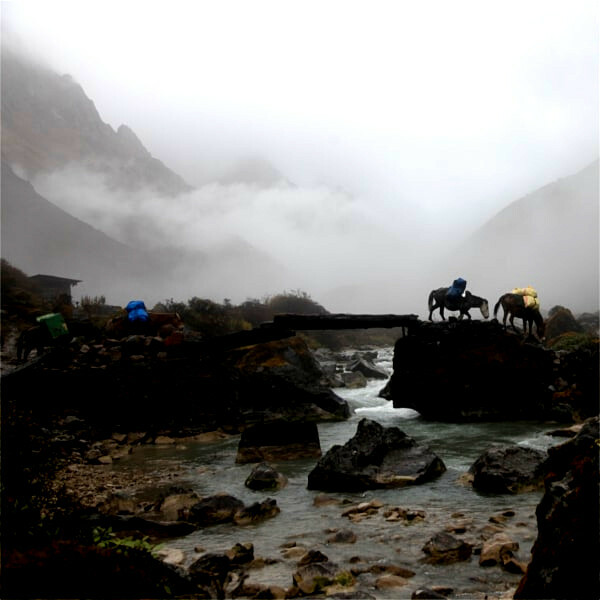 Horse riding facilities are available (own expense) till view point while hiking up towards the monastery. History tells that, on this very cliff where the monastery stands today, Guru Rimpoche, the great Buddhist saint flew from Kurtoe Singye Dzong (located in eastern Bhutan) on a back of Tigress to subdue the demon who was opposing him from spreading Buddhism in Bhutan. Hence the name Taktsang, Tigers Lair or nest derived. After subdueing, Guru Rimpoche meditated here for 3 years. The monastery was later built in 1694 by 4th Druk Desi (secular head of the country), Gyalse Tenzin Rabgye. Tragically, the monastery was gutted down by fire in the year 1998 but soon it was restored to its former glory. Your short and memorable tour of Bhutan comes to an end today. After breakfast, your guide and driver will see you off at Paro international airport for your onward destination. Some may find food in Bhutan monotonous with the same menu being offered in every restaurants and hotels but these foods are true to Bhutan, unique in its own way, different from anywhere else in the world. Bhutanese people are very fond of spicy foods and chili lies in the center of every cuisine as its main ingredient. A proper meal from the Bhutanese point of view is a plate full of rice with curry prepared either of vegetable or meat items. Ema Datshi (Hot chili and cheese); refer to as Bhutan’s national dish. Bhutan being cultural destination rather than a culinary, there are not much to choose from but whatever that are offered are authentic and native. Other than rice and curry, Momo is a popular snack that one will enjoy in Bhutan. Momo is a Tibetan originated dumpling stuffed with cabbages and onions along with beef, pork or cheese. Other than Bhutanese cuisine, restaurants in Bhutan also serves Chinese and Indian dish such as noodles and Roti. Popular drink one must try while at Bhutan are Suja, the salted butter tea, Ara the locally brewed wine from rice, maize or millet and Bangchang the rice, millet or maize beer. It will be quite a task to get Ara and Bangchang at western parts of Bhutan but are easily available if you are visiting some of the far away villages in eastern parts of Bhutan; they will even offer to you for free as a gesture of hospitability. Refrain from drinking water directly from tap or streams. Bottled water will be provided everyday by the tour operators. Tourists to Bhutan are not allowed to travel on their own and it is mandatory to use the service of a professional guide trained and certified by Tourism council of Bhutan. Guides in general speak English but language speaking guides are also available for few languages such as French, German, Chinese and Japanese. Your guide and driver along with tour vehicle will be waiting for you at the port of entry. Entry fee to all the tourist visiting sites and museums. Bottled water during the day.